Audible Songs From Rockwood was longlisted for the Polaris Music Prize, which is rad. I hope that the jurors all get the liner notes, but is it corrupt to send them the liner notes? Is that considered bribery? I don't know. Here they are. Truly had a wonderful time in Dawson City. Thanks to the KIAC Print festival for bringing me out there. Going to the Yukon soon. Well, gotta hang my head down and say thank you to The Undertaker for 27 years. Here's a tribute video that a few kids in New York City made for him - they used my song The Undertaker which explored the wrestler's lack of trust and its impact on his relationships. A Tribute to the Undertaker - A Generation of Destruction from Rob Martin on Vimeo. Jeff Bierk took the Photo on the front. Stay tuned for more information about it. 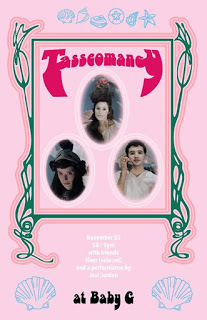 as well on november 23 gonna open the release show for these freaks, Tasseomancy. Please see notice below regarding upcoming shows. If you live in Toronto, it's worth going to see Land of Destiny, a documentary by Brett Story from 2010 that's showing at HotDocs cinema on August 15. I wrote an original tune for it and recorded it with Dave Clarke and Paul Mortimer at Rick White's. It's a powerful account of the effects of the Petrochemical industry on the people in Sarnia who are caught in the conflict of both making their living and dying from the work it brings. Later on I wrote this song about the parallel conflict, images from the film very much in my mind. Just had a great tour with USGirls. Really great to tour those rooms with people I love and admire. Thanks Meg, you freak. From Left to Right, Joni, Rhubarb, Roxy and me. We're touring the west part of Canada so, if you wanna catch those shows check out the listings here at The Highest Order Website. But also May I invite you to join me in May as I run down the west coast with USGirls? In the first week of february I had a good time at Megaphono. The hell mouth never looked so good. Nice review right here... So nice when people talk about the songs in music reviews. Gonna play Idee Fixe Records (that's french, but it's the name of the label that puts out The Highest Order ) Vth (5th) anniversary party twice - once solo on February 25th, at the Horseshoe, and then with The Highest Order on the 26th at the Garrison. Ah yeah, and I'm playing Kazoo Fest come April, opening for Chad Van Gaalen in Guelph, so that's alright. I once got kicked out of that church, but that story is for a live audience. On December 20th, I'm playing a fundraiser for Girls Rock Camp Toronto, with the holiday wish that they go gender neutral and all children can just grow up thinking they can play rock and roll if they so feel without the burden of gender one way or another. And also, should mention I am playing a show with Jennifer Castle on the 21st for the Winter Solstice. That's right, I composed and recorded the soundtrack to the short documentary "World Famous Gopher Hole Museum" by Chelsea McMullan and Doug Nayler about this curious tourist attraction in Alberta. It premiered at TIFF and was really good to see in the big theatre surround sound. I made this poster for it too. In the opening song of Pink City, Jennifer Castle asks the question: "Can anybody hear me?" There's the disaffected ear of a dominant culture that's forgotten poetry. There's the planned obsolescence of song, expected to stream forth, perpetually new. There are still men relegating women's voices to ornament. And there is the fear sown by government and industry, muffling those who warn against the hollowing of the land. The songs on Pink City both address and transcend these hostile conditions. Jennifer Castle, with voice, guitar and piano, sings together truths of the body, poverty, our part in nature, labour of all kinds, the will. The album is sometimes unsettling, sometimes friendly, oblique in form, and still direct. And so to the question "Can Anybody hear me?" the answer is "Yes." And more people will, right now. I would call her singular but for the fact that she sings for so many. Friends of all genders, your 2015 Polaris Music Prize short list nominee for Pink City, the undeniable Jennifer Castle. You should get that record. MADE A VIDEO FOR MY BAND "THE HIGHEST ORDER"
And I wrote the song too. NEW VID FOR 'DAYTON' OFF "Lost the Plot"
Starring Carl Lance Bonicci, and directed by Jeff Bierk. Simone and collaborator Jeff Bierk have released a poetry book for gentle people aged 0-1000. You can order it here.